Amid fears of a German invasion of British soil in 1940-1941, Britain began preparing for the worst. The fear was, in particular, the capture of airfields by German paratroopers – a fear that would come true in the Battle of Crete, May, 1941. Recognizing the danger, tanks and other AFVs were seen as an effective means of defending airfields, but due to the loss at Dunkirk, there was no real means of equipping airfields with AFVs. 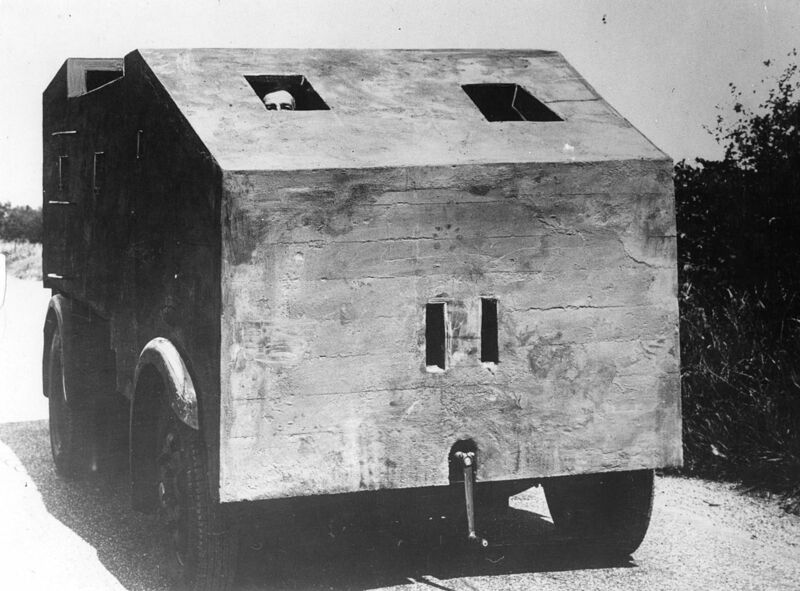 The ‘Bison Mobile Pillbox’ was the ideal solution. 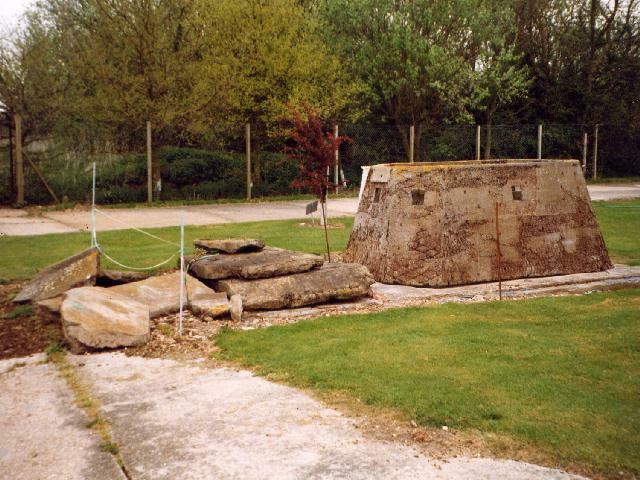 The idea was to take available trucks and place concrete bunkers on the rear, thus making a mobile pillbox. As many as 300 were built, with one, and the remains of another, still in existence today. The idea of a concrete bunker came from Charles Bernard Matthews, the owner of Concrete Limited, and his commercial partner, John Goldwell Ambrose. They had both previously served in the Royal Engineers during WWI, thus meaning that they had serious expertise in designing concrete bunkers. 24 old trucks were bought for testing, and a prototype was made to be shown to local military officials. After some minor design changes, production began in Stourton, Leeds. The name “Bison” was chosen, as it was the company trademark at the time. Due to the sheer weight of the concrete, only heavy lorry chassis could be realistically suited to the conversion. Nevertheless, lorries of all types and ages were used in the production of the Bison, and each Bison varies from the next, but there appear to have been three main types. Type 1 was a fully armored cab and a small fighting compartment with a canvas roof. Type 2 had an armored cab with a separate concrete pillbox on the rear. Type 3 was a fully armored cab and adjoining fighting compartment, fully covered in concrete. The bodywork was stripped from each vehicle and replaced with wooden formwork, and some expanded metal was placed in between the new structures. Fast setting concrete was then poured on to create the armor, which was up to 152mm (6 inches) thick. Roofed versions had a pre-cast roof. Some were also built on steam-wagons, which were not self-propelled due to their boilers being removed, but could be towed. Type 3 fully enclosed Bison, government photograph circa 1940/1. Bisons were primarily intended to defend airfields, but also reportedly saw service with the Home Guard. Testing revealed that the concrete was resistant to Bren guns and armor piercing rounds, and this would certainly be sufficient defense against German paratroopers. However, this protection was not a calculated trade-off. They could hardly be described as ‘mobile’ pillboxes due to the weight of the concrete, poor radiator cooling, and poor driver situational awareness. They were, therefore, towed or abandoned after breakdowns. 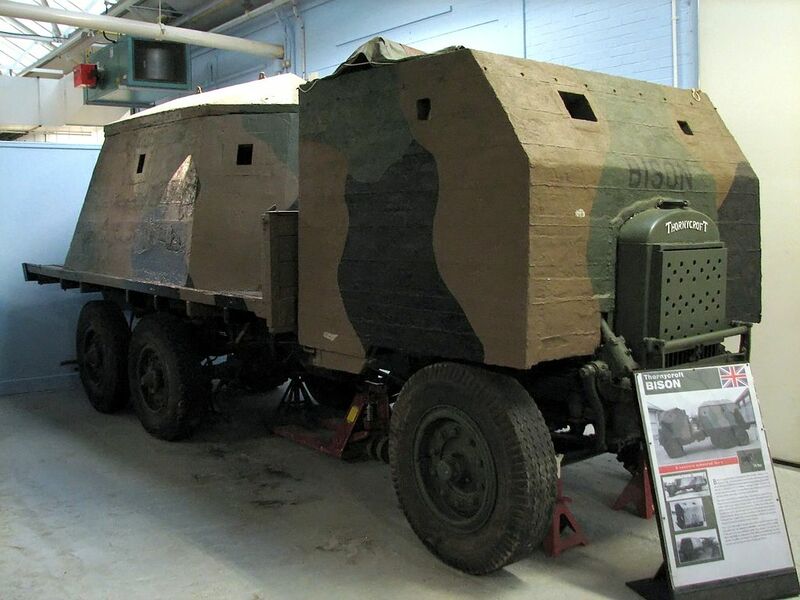 One full type 2 Bison semi-replica was reconstructed at Bovington Tank Museum using remaining Bison parts and a Thornycroft 3 ton 6×4 truck, military type (although it is suggested that a military lorry would probably not be handed over for these purposes). A hatch has been cut into the lorry’s decking for access to the pillbox, and the cab is open-topped, access being granted through climbing over. The pillbox design is a late-type – the sloped design saved on weight, whereas earlier designs were rectangular. A small steel plate has been placed to protect the engine and radiator, but would be insufficient to protect against small arms fire. Parts of a Bison stand at Lincolnshire Aviation Heritage Center today. This particular Bison had originally been used by the Home Guard to defend RAF Digby. Later in the war, airfield protection at Digby was not needed, and the vehicle was stored, only defending a roadblock on the A15 (a major road) near Sleaford. Before the war’s end, it was abandoned, vandalized, and the chassis was used as a farm trailer. In 1988, the Lincolnshire Aircraft Recovery Group found out about the vehicle and on 22nd March 1991, the remains were taken to the museum. Bison, Type 2. This type featured a separate fighting compartment. Bison, Type 3, late model. As seen in a government photo from 1940/1. Type 2 Bison at Bovington. Some parts are original, but the truck chassis is not one that would originally have been used. Small type 3 Bison, early model, as shown by the rectangular type. The engine handle crank is seen below, as well as two ventilation slits for the engine. Remains of a Bison on display at Lincolnshire Aviation Heritage Center. Whilst they may look like meaningless, unimpressive slabs of degrading concrete, their historical significance is considerable. Originally published on 26 April, 2016. This is quite genius! Did the Germans or Americans ever produce anything similar to the Bison? I know the US never really feared invasion by the Germans or Japanese, but the Germans must’ve at least been aware of the US and British paratrooper and SAS units being formed on the East Coast of the US and training grounds in England. Great article, I look forward to the next one!